The "Invoices" section allows you to view your invoices and to make payments to open invoices. 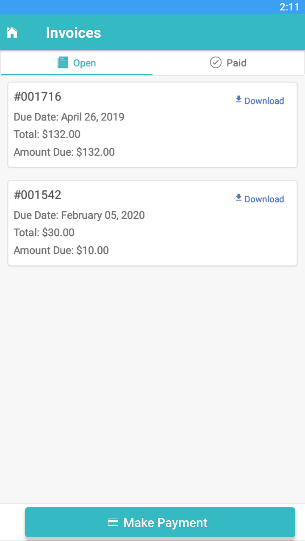 This section can be accessed by selecting "Invoices" on the homepage of the app. You can review all invoices on this page. You can also download invoices directly to your mobile device by clicking on "Download". You can make a payment by clicking the "Make Payment" button at the bottom of the screen. If your pet care company has not enabled payments via the mobile app, you will not have access to the "Make Payment" button. You can then select which invoices you would like to pay by clicking the on an invoice(s) that you would like to pay. After selecting an Invoice, you will see the invoice has been highlighted and you have the option to leave a tip. If you do not wish to pay this invoice, you can de-select it by clicking the green "Will Be Paid" button. 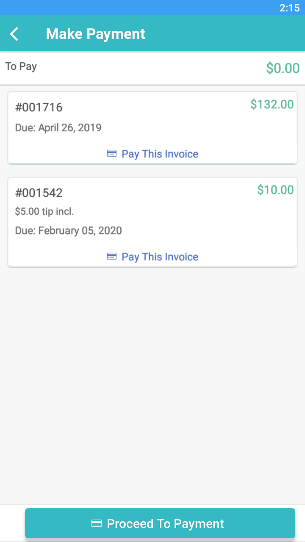 You can also select multiple invoices to be paid at once. If your pet care company has not enabled tips via the mobile app, you will not see the "Add Tip?" button. 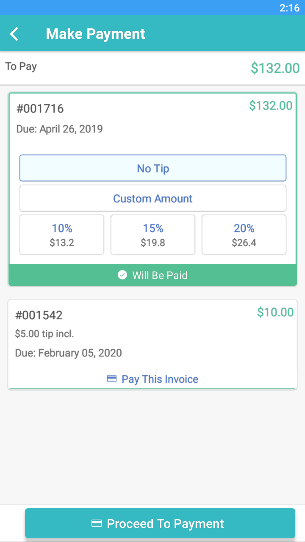 You can review the total amount to be paid by reviewing the "To Pay" section at the top of the app. When ready, you can proceed to payment by selecting the "Proceed To Payment" button. If you have a payment method on file, you can select the existing payment method. 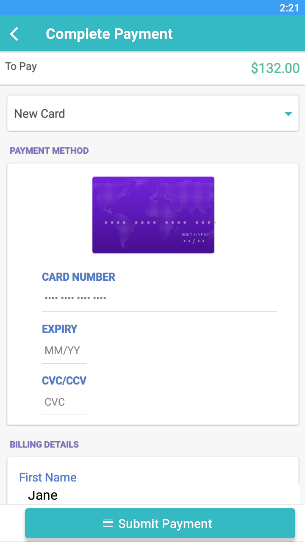 You can also add a new payment method. After selecting your payment method, you can click the "Complete Payment" button to process the payment.